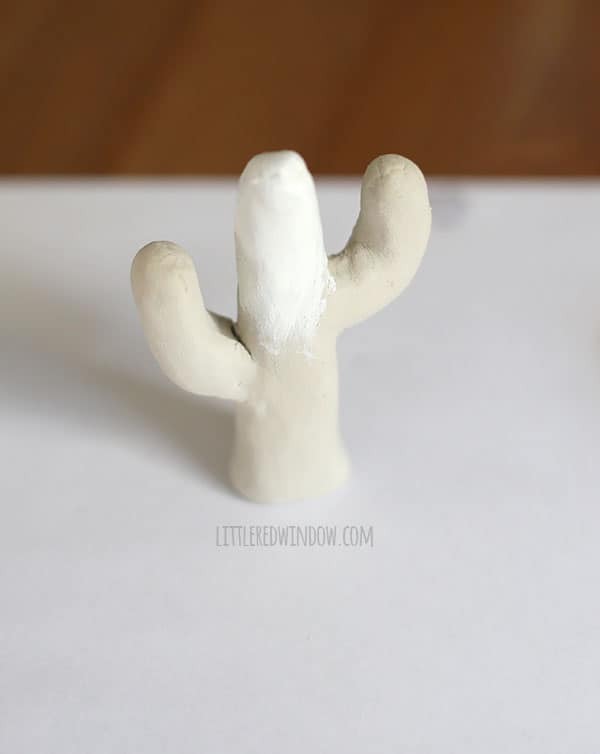 Make your own cute cactus ring holder from air dry clay! 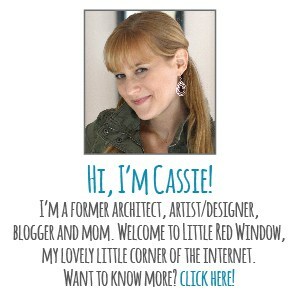 I’m sure I’m not alone in this, once I had babies I pretty much stopped wearing much jewelry. For one thing I work at home now so if I put on jeans that aren’t distressed, that’s pretty fancy. But also, the grabby little baby hands! So it’s pretty much only stud earrings and teething necklaces. But I’m a jewelry lover and I’ve acquired a lot of lovely stuff over the years and I like to keep it where I can at least look at it! I made myself a very cool earring holder last summer and now I was looking for somewhere to keep rings where I can see them. 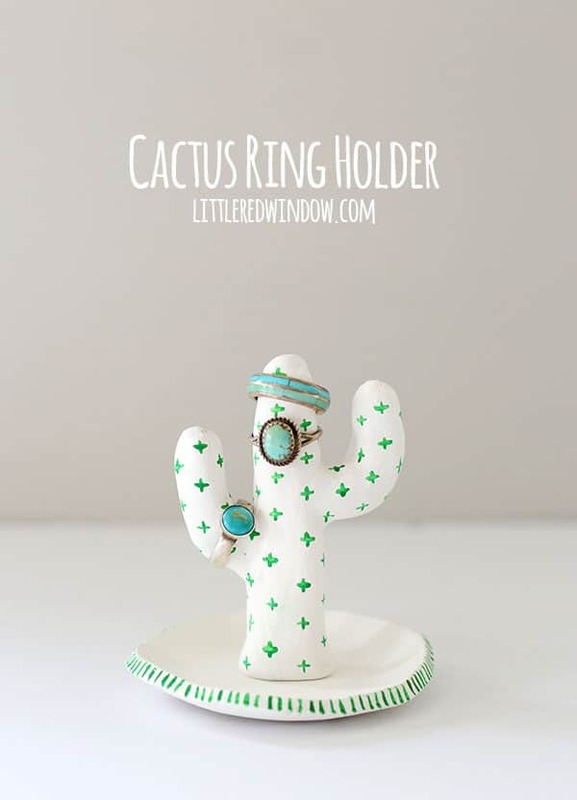 I decided on a cactus ring holder which I thought was an original idea until after I made it and then googled it and saw that apparently I was not the first person to think that would be cute. 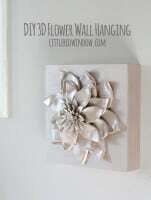 (And that is why I never google before crafting!) But nonetheless, I sure like how my version turned out! And it was super easy to make. I should preface this by saying, somehow I did a terrible job taking pictures of this one. I apologize. But it’s so easy, you don’t really need that many anyway! 1 . 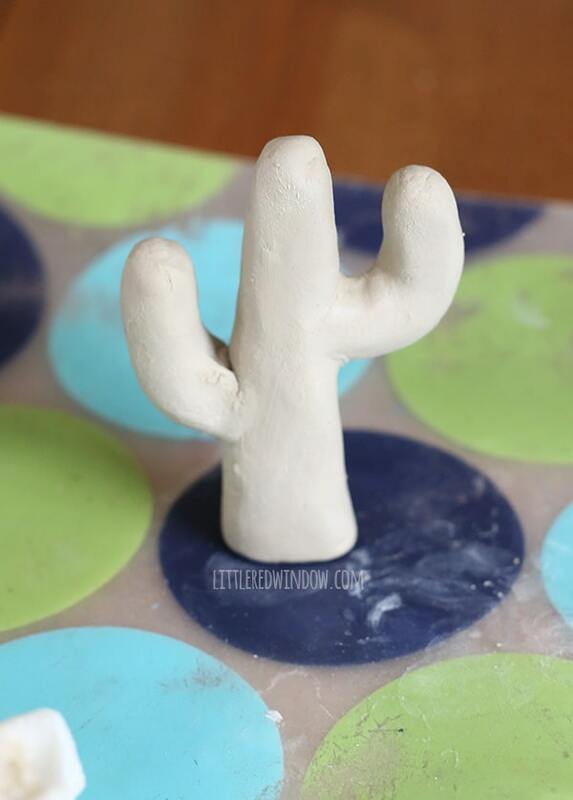 Open your clay and rolls some snake shapes, one big and tapered, and two smaller, to make the cactus. 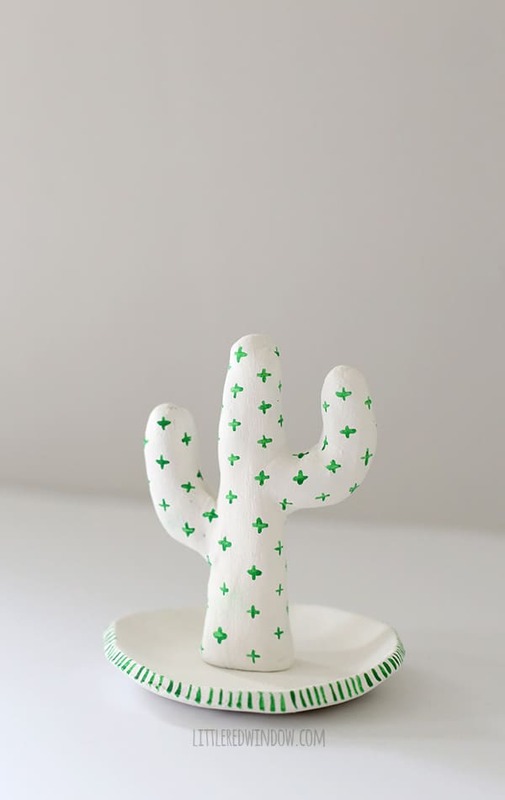 I don’t have a pic of this step, but to connect the cactus arms you can just add a tiny bit of water and smooth the joint together. 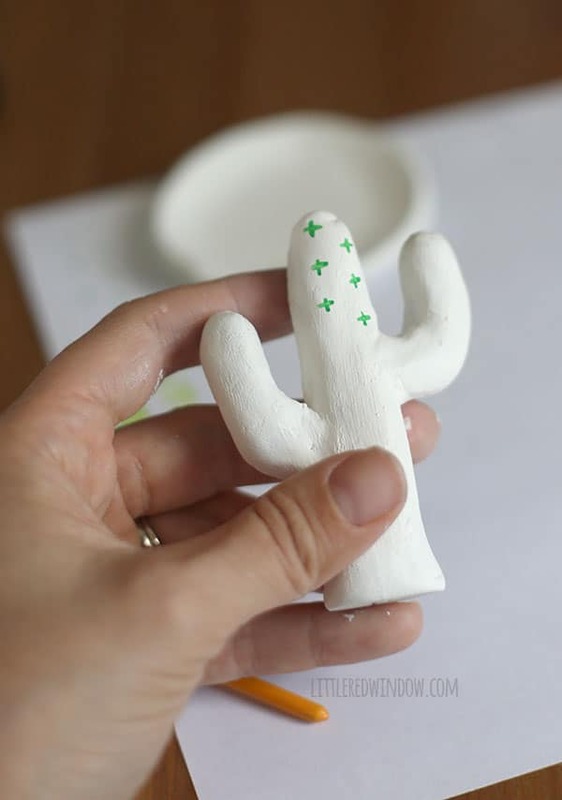 Then use a damp finger to smooth the entire cactus shape. 2. 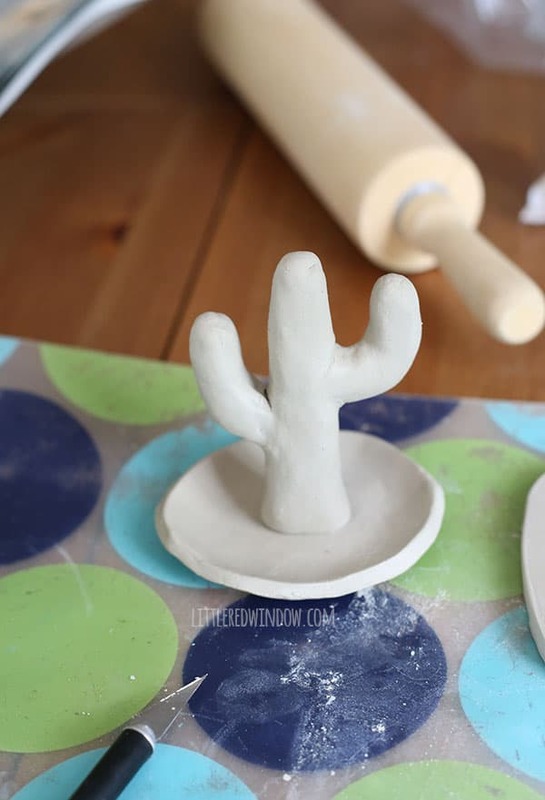 Next, use a rolling pin to roll some clay to about 1/4″ thick and then cut a small freehand circle with a craft knife or other sharp clay tool. Use damp fingers to smooth the edges and then gently shape the edges so that the dish has a small lip. 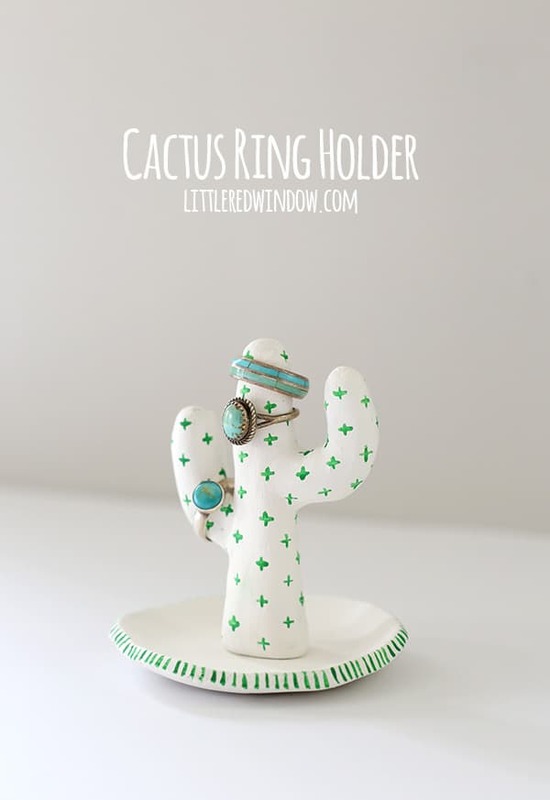 (If you want to see pics of this, check out how I made these painted ring dishes) I thought I could easily connect the cactus to the dish but it didn’t go so well so instead I’d recommend that you let them dry separately. 3. Then when the clay is fully dry (at least overnight, maybe longer depending on how thick your cactus is) you’re going to want to paint the clay. The only downside to this brand of air dry clay is that is doesn’t dry completely white, so I gave my ring holder a coat of white paint. Then I used a tiny detail paintbrush to add the “spikes” on the cactus and the decorative pattern on the dish. 4. 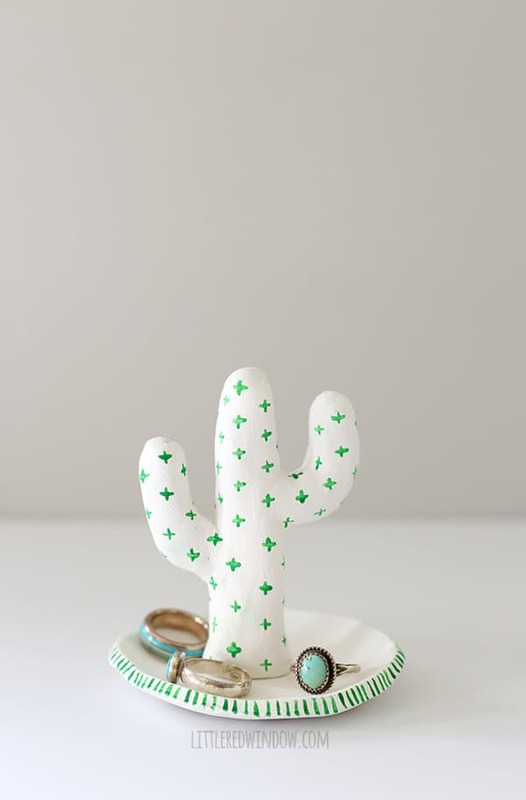 Finally, glue the cactus to the ring dish. And that’s it!